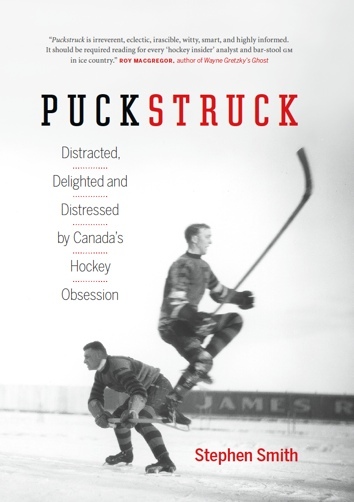 If you’ve been reading the book called Puckstruck: Distracted, Delighted and Distressed by Canada’s Hockey Obsession, which appeared on paper, between hard covers, in the fall of 2014, it’s possible that you’ll have arrived on page 402, where promises are made regarding sources for all (most?) of the stories I spin and claims I make in the pages preceding. Those are these, herebelow. Questions or suggestions, corrections, beeves or bewilderments, please send me an e-mail at puckstruck@gmail. 76 puck breaking in two: Ibid. 174 God Save the King: Ibid. 195 free of foreign additives: Ibid. 224 (looking at you, Carl Brewer): Ibid. 233 hockey getting too violent? Ibid. 283 wanted to parley: Ibid. 316 beefs with boys’ clubs: Ibid.